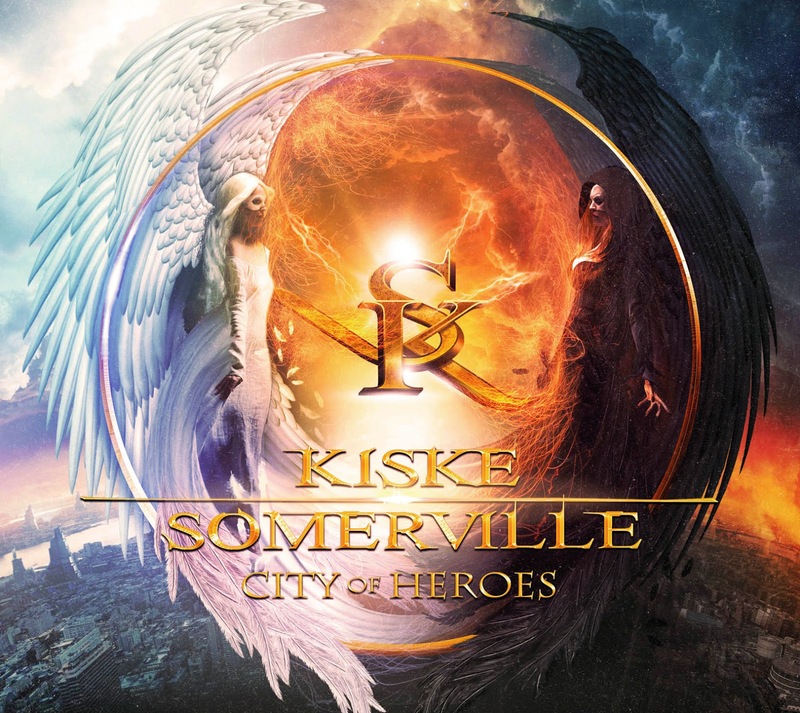 Rock & Metal 4 You: CD-Review: Kiske/Somerville - "City Of Heroes"
CD-Review: Kiske/Somerville - "City Of Heroes"
When the first Kiske/Somerville album was released in 2010 the resonance of fans and press was great , so the question was: will there be a sequel? Everybody was hoping so. In the meantime there was lots of talking. Michael Kiske and producer Mat Sinner told me already in 2013 a new Kiske/Somerville record is on the way and it will be great. But then another two years went by and now "City Of Heroes" will finally hit the stores on April 17th. Can this album keep up to its high expectations? Five years is a very long time and much can change in such a period of time, especially when some other musical directions are more popular then five years ago. Luckily not much has changed in the Kiske/Somerville camp. True to the motto: never change a winning team. On "City Of Heroes" you won't find any experiments. Mat Sinner produced already the first record and so he did on "City Of Heroes". Of course he is also part of the band. Most of you will be excited to hear that Magnus Karlsson is also back - and I can tell you one thing: he delivers once more! Everybody who missed Magnus on the latest Allen/Lande record will be pleased with his appearance on the new Kiske/Somerville because his songwriting skills are written all over it and his guitarwork is excellent - as always! Mat Sinner and Magnus Karlsson wrote most of the tracks and it is again a symbiosis between Melodic Metal with some symphonic elements, some Hard Rock here and there and a certain kind of Pop influence - especially in the choruses. This time around the songmaterial is more catchy and more energetic at the same time. It isn't about being heavy as hell, the focus lies on the two singers and their vocal harmonies. They simply sound perfect together. Amanda has an outstanding recognizable and warm voice and she is always present on this album. I think I don't need to say that much about Michael Kiske, because everybody knows what his vocal cords are capable of, although I have to admit that it feels like Amanda is a bit more on focus this time - you notice this especially when the choruses kick in. It's just my subjective feeling. Like I said the record is full of catchy tunes and some of them are true Melodic Metal jewels. Let me point out some highlights: it all starts with the fantastic title track "City Of Heroes" that pairs all the strengths of this ambitious project. It's melodic and it rocks! The next highlight follows with "Walk On Water" - this is another earworm I can't get out of my head. With "Rising Up" it gets a little more heavy - a very 80's influenced Hard Rocker. "Salvation" shows a more atmospheric side and is another winner. "Lights Out" is one hell of a track where you definitely can hear Magnus Karlssons influence very clearly. This one could have been part of the first Allen/Lande album - perfect! Another absoluetely killer track (and my personal favorite of this album) follows with "Open Your Eyes". This tune has the word "HIT" written all over it. The amazing guitarlines of Karlsson and the infectious chorus make this track to one of the best songs I've heard this year so far. It's hard to beat this tune, but "Run With A Dream" is very close to it. This is another Rocker that is catchy as hell and makes you sing along for days. You see there are so many highlights united on one album and also the rest of the songs is far away from being bad. I can't see any filler here. Only some of the lyrics are a bit too cheesy, but this is nagging on a very high level. Productionwise everything sounds fantastic and this is no wonder because Mat Sinner did the production and famous producer Jacob Hansen (Vollbeat, Pretty Maids, Primal Fear) took care of the mix. Keyboards are a bit more present this time, but the keys go perfectly hand-in-hand with the loud guitars and the tight rhythm section. That all is packed in a crisp production and you have one hell of an album. Finally I just can say that all musicians who were involved in the Kiske/Somerville project have outdone themselves. I'm always sceptical when it comes to such projects, because there are simply too many on the market and most of them are just soulless cash machines, just good for making money. Not so with "City Of Heroes" - it is a passionate, catchy and rockin' record from start to finish and combines excellent songwriting with a top-notch production and vocals to die for. "City Of Heroes" is a hundred percent increase to the debut album and I can just say: it was worth the wait! Hopefully we don't have to wait another five years for a third effort. He was wrong, we were all Right !! !